Skyfall is the twenty-third spy film in the James Bond series, produced by Eon Productions and distributed by MGM and Sony Pictures Entertainment.It features Daniel Craig‘s third performance as James Bond, and Javier Bardem as Raoul Silva, the film’svillain. The film was directed by Sam Mendes and written by John Logan, Neal Purvis and Robert Wade. Q, played by Ben Whishaw, and Miss Moneypenny, played by Naomie Harris. Following the death in the film of Judi Dench‘s M, the post of head of MI6 is taken up by Gareth Mallory, played by Ralph Fiennes. Mendes was approached to direct the film after the release of Quantum of Solace in 2008. Production was suspended when MGM encountered financial troubles, and did not resume until December 2010; during this time, Mendes remained attached to the project as a consultant. The original screenwriter, Peter Morgan, left the project during the suspension. When production resumed, Logan, Purvis and Wade continued writing what became the final version of the script, whilst incorporating Morgan’s ideas. Filming began in November 2011, and primarily took place in the United Kingdom, China and Turkey. Skyfall premiered on 23 October 2012, and was released in the United Kingdom on 26 October 2012. 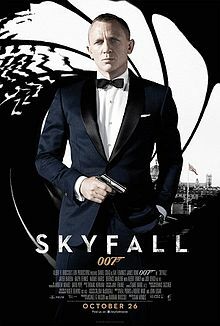 It was the first James Bond film to be screened in IMAX venues, although it was not filmed with Imax cameras.The film’s release coincided with the 50th anniversary of the James Bond series, which began with Dr. No in 1962. MI6 agents James Bond—also known as 007—and Eve Moneypenny assist on a mission in Turkey in which an MI6 operative has been killed. A computer hard drive has been stolen containing details of all NATO agents operating undercover in terrorist organisations. Bond and Moneypenny chase the assailant, the French mercenary Patrice, and attempt to recover the disk. During the chase, Bond is shot in the shoulder. He nevertheless continues his pursuit until he is shot at long range by Moneypenny, who is attempting to kill Patrice. He is posted as “missing, presumed killed”. The head of MI6, M, comes under political pressure to retire during a meeting with the Chairman of the Intelligence and Security Committee, Gareth Mallory. On her return from the meeting, MI6 is hacked and an explosion occurs in the offices, killing a number of MI6 employees. On hearing the news of the attack, Bond returns to London. Shrapnel taken from his shoulder wound points to Patrice, and Bond is sent to Shanghai, where it is known the mercenary will shortly arrive. Five of the agents’ names are released, with the promise of more releases in the ensuing weeks. Bond finds and follows the Frenchman, and witnesses him carry out an assassination. The two men fight, and Patrice falls to his death before Bond can find out who he is working for. Searching the assassin’s equipment, Bond finds a gambling chip, which leads him to a casino, where he is paid €4 million for the kill. Sévérine, who Bond saw earlier at the scene of the assassination, warns him that he is about to be killed, but promises to help him if he will kill her employer. Bond beats his attackers and joins Sévérine on her boat. They travel to an island, where they are taken prisoner by the crew and delivered to Sévérine’s employer, Raoul Silva. Silva had previously worked with M and blamed her for his capture, torture and imprisonment by the Chinese. Silva kills Sévérine, but Bond overpowers his guards and captures Silva for return to the UK. Back at MI6 headquarters Q attempts to decrypt Silva’s laptop, but while he is accessing the computer it hacks the MI6 systems, allowing Silva to escape into the London Underground tunnel system. Pursued by Bond, Silva disguises himself as a policeman and attacks M during a public enquiry into her handling of the stolen hard drive. Bond arrives to join Mallory and Moneypenny in beating off Silva’s attack, and M is hurried from the building by her aide, Bill Tanner. Bond drives M away from the scene in her car and, after exchanging it for his own Aston Martin DB5, drives her to his empty and remote childhood home in Scotland, Skyfall. He instructs Q to leave an electronic trail for Silva to follow, a decision supported by Mallory. At Skyfall, Bond and M are met by Kincade, the gamekeeper to the Bond family estate. The trio are only lightly armed, but they improvise a series of booby traps. When Silva’s men arrive, Bond, M and Kincade fight off the first assault, although M is wounded. Silva arrives by helicopter with a second wave, and Bond sends M and Kincade off through a secret tunnel at the back of a priest hole to a chapel on the grounds. The second assault uses firepower from the helicopter, and Silva throws incendiary grenades into the building. Bond detonates a stick of dynamite with two gas canisters and retreats down the same tunnel as M and Kincade. The resulting blast causes the helicopter to crash, killing a number of Silva’s men. Silva sees Kincade’s torch beam, follows and arrives at a frozen lake ahead of Bond. Bond attacks Silva’s sole remaining follower, and the two fall through the ice, where Bond kills him. Silva meanwhile makes his way to the chapel and forces his gun into M’s hand where he begs her to kill them both. Bond arrives and kills Silva, but M collapses from her earlier wound and dies. Her position as head of MI6 is taken by Mallory, while Moneypenny decides not to return to the field as an agent. The main cast of Skyfall was officially announced at a press conference held at the Corinthia Hotel in London on 3 November 2011,fifty years to the day that Sean Connerywas announced to play James Bond in the film Dr. No. Javier Bardem as Raoul Silva (Tiago Rodriguez),the film’s main antagonist. Silva is a former MI6 agent turned cyberterrorist who is seeking revenge against those he holds responsible for betraying him.Bardem described Silva as “more than a villain”, while Craig stated that Bond has a “very important relationship” to Silva.In casting the role, director Sam Mendes admitted that he lobbied hard for Bardem to accept the part. Mendes saw the potential for the character to be recognised as one of the most-memorable characters in the franchise and wanted to create “something [the audience] may consider to have been absent from the Bond movies for a long time”.He felt that Bardem was one of the few actors up to the task of becoming “colourless” and existing within the world of the film as something more than a function of the plot.In preparing for the role, Bardem had the script translated into his native Spanish in order to better-understand his character, which Mendes cited as being a sign of the actor’s commitment to the film.Bardem dyed his hair blond for the role after brainstorming ideas with Mendes to come up with a distinct visual look for the character. Judi Dench as M, the head of MI6 and Bond’s commanding officer. Skyfall was Dench’s seventh and final appearance in the role. Ralph Fiennes as Gareth Mallory (who becomes M at the end of the film),the Chairman of the Intelligence and Security Committee.His position gives him the authority to regulate MI6.Fiennes stated that he could not say anything specific about the role other than that it was a “really interesting part which is really quite fun”. Naomie Harris as Eve Moneypenny.Harris’ role was initially presented as that of Eve, an MI6 field agent who works closely with Bond. Despite ongoing speculation in the media that Harris had been cast as Miss Moneypenny,this was not confirmed by anyone involved in production of the film, with Harris herself even going so far as to dismiss claims that Eve was in fact Moneypenny, stating that “Eve is not remotely office-bound”.According to Harris, Eve “[believes] she is Bond’s equal, but she is really his junior”. Bérénice Marlohe as Sévérine.Marlohe described her character as being “glamorous and enigmatic”,and that she drew inspiration from GoldenEye villain Xenia Onatopp (played by Famke Janssen) in playing Sévérine. Albert Finney as Kincade, the gamekeeper of the Skyfall estate. Rory Kinnear as Bill Tanner, the MI6 Chief of Staff. Helen McCrory as Clair Dowar, a British minister.McCrory joined the cast after Sam Mendes contacted her personally and offered her the part. Ola Rapace as Patrice, a French mercenary who “is a man of few words” and “loves violence”. Jens Hultén appears in the film, reportedly playing an accomplice of Javier Bardem’s character.Ben Loyd Holmes confirmed on Twitter that he had a role in the film.Greek model Tonia Sotiropoulou, who unsuccessfully auditioned for the role of Sévérine, revealed that she was cast in a secondary role in the film. This entry was posted in Movie, Uncategorized and tagged james bond, movie, skyfall, skyfall james bond, skyfall review, spy movie, top boxoffice, top hollywood movie 2012, top movie 2012, top movies. I love Daniel Craig as James Bond, I think he’s really been able to sink his teeth into the role. I am really impressed along with your writing abilities as well as with the layout for your blog. Is that this a paid topic or did you modify it your self? Either way stay up the nice quality writing, it’s uncommon to peer a great blog like this one nowadays..